Love may be a little anthropogenic for toads but the eons old “urge to merge” was quite prevalent last Sunday (4/7) when we were at Oconee State Park. Oconee State Park, in Mountain Rest, Sc., is along U.S. Hwy 11 around 14 miles south of Cashiers, Nc. and about an hour and a half drive from Waynesville. The 1165-acre park is an easily accessible, low key, family-friendly destination built by the Civilian Conservation Corps back in the 1930s. Nineteen cabins built by the CCC are available for rent plus there are another 140 standard campsites with water and electrical service plus 15 tent sites. There are two lakes on the property that offer canoe, kayak, paddleboat and johnboat rentals. There is supervised (lifeguards) swimming during the summer. There is an “Old Barn” near the park office where square dancing is offered every Friday night from Memorial Day to Labor Day. For all its genteel amenities, the park is still a gateway for some of the best wilderness hiking in the upstate. It serves as the western entrance to the Foothills Trail – 76 miles of escarpment trekking that ends at Table Rock State Park. We were there just for a little end of spring break R&R and to let kids stretch their legs and imagination one last time before the routine starts again. It was double fun because the Wamplers, Steve, Stephanie and their two boys, Andrew and Adam, joined us. We commandeered a picnic table near one of the lakes where we unloaded bags of food, camp chairs and bicycles. Next we rented a johnboat and a canoe and we were set for the afternoon. 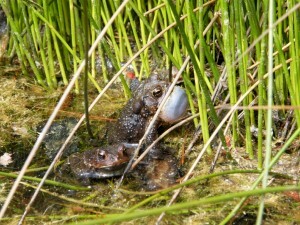 Even from our spot at the opposite end of the lake we could hear, in the distance, the mating trill of American toads. This long, musical trill is high-pitched and can run on for half a minute or so, it’s pretty loud too. After we got n the boats we kind of migrated toward the trill. We wound up in a really shallow area at the end of the lake. There was a wood duck box there but it was empty. However, a pair of Canada geese had a nest in a marshy area just beyond where the lake ended for boat traffic. 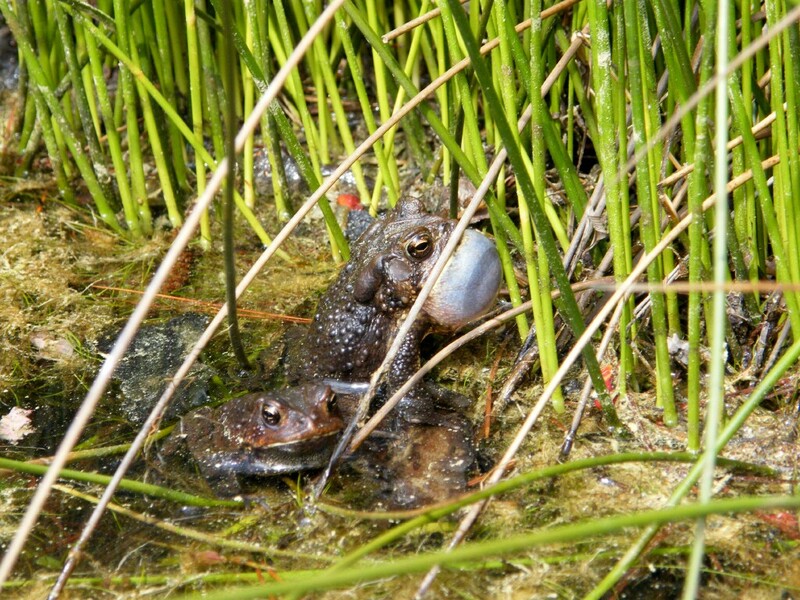 As we got closer to the marshy end of the lake, the trills from the toads got louder and louder, it was evident that they were breeding in the reeds and grass in the shallows. Finally, as our eyes acclimated we were able to pick them out. We could see dark silhouettes next to the green reeds. As we quietly and slowly drifted in, we could pick out calling males with their vocal sacs expanded. The males call by inflating part of their mouth lining under their throat with air from a hole in the bottom of their mouths, closing off their mouth and nostrils and pumping this air over their vocal chords. This is what produces the vocal sac. The female toads, who also feel the urge, approach the males. The males latch onto the backs of the females. The males have (during breeding season) large nuptial pads on the dorsal surface of their “thumbs” that help them cling to the female. Their forearms are also bigger and stronger than females and when they latch on with their nuptial pads during breeding it is known as amplexus. As the female lays her eggs in large strands, the male fertilizes them. We were privy to the whole show – the males calling; the females approaching; amplexus; and the eggs being deposited on the reeds. Nature is such a wonderful teacher if we simply pay attention.